Uber, a young startup that let’s people book a black car service on the fly via their mobile app, has closed an $11 million round valuing the company at $49 million pre-money valuation, $60 million post-money, we’ve confirmed from sources. Benchmark Capital led the round, with participation from previous investors. Benchmark partner Bill Gurley joins Uber’s board of directors. Sequoia Capital partner Alfred Lin, we’ve heard, also participated in the round as an individual. It’s been quite a year for the company that was originally thought up by StumbleUpon founder Garrett Camp. He doesn’t own a car, wanted a private car service instead of using taxis, but didn’t want the cost of a dedicated car. What makes Uber special? Users love it, for starters. 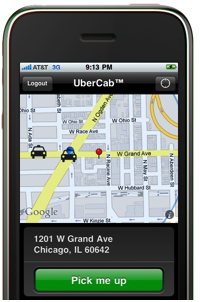 You ask for a black car to come to you on the mobile app, then watch it come to you as the app tracks the car via GPS. Payments are handled automatically by charging the card you have on file, and it costs about 50% more than a taxi. And the company has put a huge focus on logistics tech. To maximize utilization and minimize wait times they’ve spent a lot of time looking into dynamic prices, demand prediction, etc. At the user level, it just seems to work. There have been tens of thousands of paid rides, says the company, since launching last summer. And that’s just in San Francisco.